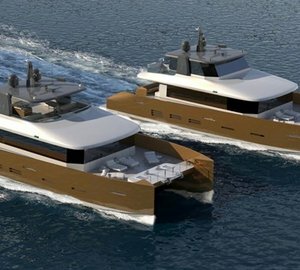 ERDEVICKI superyacht design is proud to introduce their modernised 125ft explorer trawler-type yacht design. 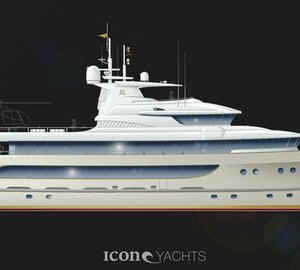 The brief was to minimise any structural changes to the hull and accommodation, whilst updating the exterior look of the 125ft motor yacht. The design required to incorporate modern lines and curves to soften trawler appearance of the superstructure and clean up clattered look of the hull. Although retaining the original shear lines, the bulwark has received a tumblehome form, whilst the hull sides, split horizontally in two levels before, are now integrated into one smooth plane, main and upper decks joined by panoramic windows and stylish grilles in the passageways. The original portholes are retained with the six mid-hull enlarged to an ovoid shape for more light below. The classic vertical oblong windows on the main deck are integrated into one panoramic unit, which will let in more natural light and offer better panoramic views. The aft salon windows on the main deck have undergone the same treatment. The superstructure, distinctly trawler type before, has been restyled, softened and rounded with pilothouse windows reshaped and enlarged for even better panoramic views. The fly bridge remains the same size but with a larger wrap-around windshield and revamped exhaust stack and mast. The aft of the fly bridge now gives an excellent view of the upper deck carrying two tenders, a dinghy and two ski-jets all handled by a hydraulic crane stowed neatly on the deck. This explorer yacht retains the accommodation for 10 – 11 guests in one master suit and four double guest cabins, one with additional Pullman berth, whilst the crew of 6 or 7 is accommodated in four cabins, captains plus three doubles. The yacht 125 x 28 feet, built in steel has the range of 4000Nm at a cruising speed of 12kn. Overall the result is very pleasing, doing away with the harshness of the trawler look and achieving the harmonious styling of a luxury super yacht preferred by discerning clients today, matched by a luxury hand crafted wood interior but retaining all the characteristic of a tough explorer vessel. 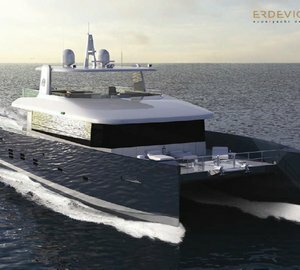 Please contact CharterWorld - the luxury yacht charter specialist - for more on superyacht news item "Modernised 125ft Explorer Yacht Design by ERDEVICKI superyacht design".